As we all know whatever it is you're doing having the right tools for the job helps you get it done easier and quicker. This is especially true in the kitchen - for example, every good cook needs a good knife, chopping board, mixing bowls and a measuring/pouring jug to name but a few. Having the right equipment makes for better results too. I'm a huge fan of OXO Good Grips since their products actually work and do the job they say they will. 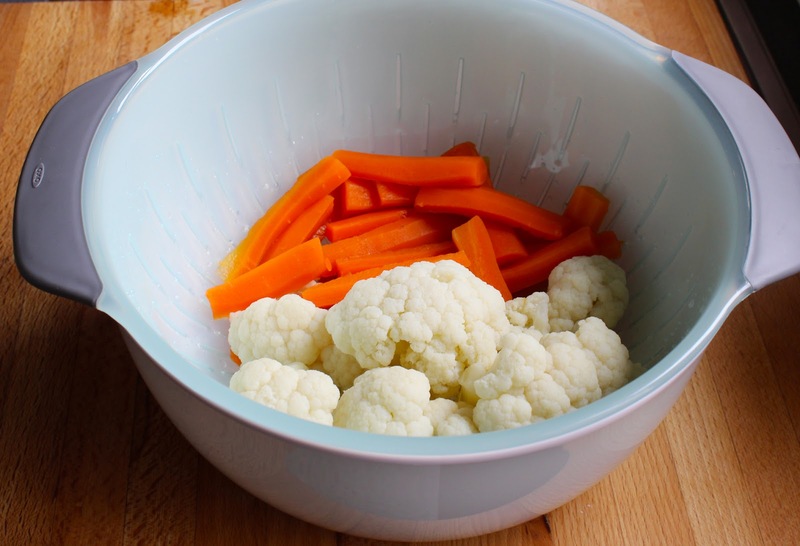 Having recently been sent the Batter Bowl and the Large 3 Piece Bowl and Colander set to review here's how it went. Fantastic for Yorkshire puddings (or co course any kind of batters or sauces. It's bigger in real life than I imagined which makes it even easier to weigh the flour directly into the bowl add the egg and salt then whisk together for perfect Yorkshire puds. Before this and the 3 piece bowl and colander set arrived I thought I would use the bowl to mix the batter in - but since it's quite large I just made the pudding batter in the Batter Bowl, saving on both mess and washing up! The Batter Bowl has a generous capacity of 8 cups/2 litres and the bowl as you can see from the picture has clearly marked out in bright red permanent measure markings. As I whisked away at my Yorkshire Pudding batter the high sides meant I didn't splatter the kitchen with mess! My review of the OXO Good Grips Silicone Balloon Whisk seen in the above picture can be found here. 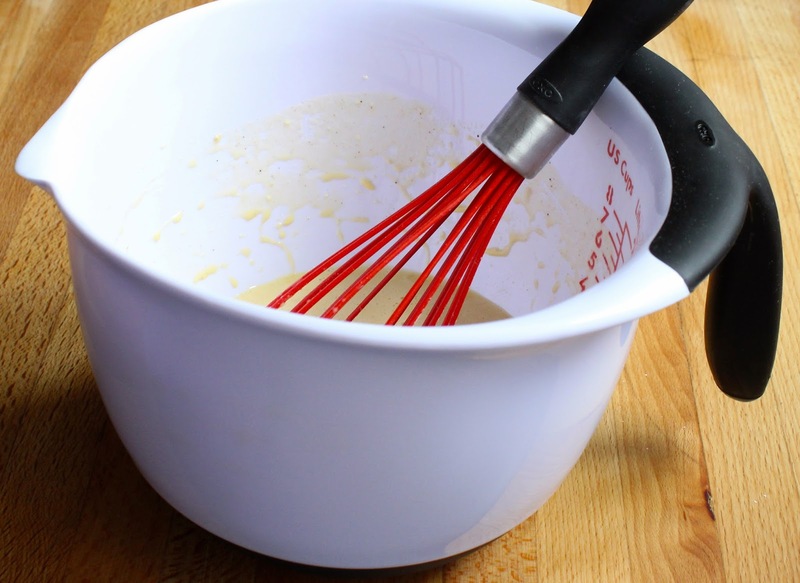 As I said before, originally I was going to use the bowl to mix the batter then transfer to the Batter Bowl/Jug. 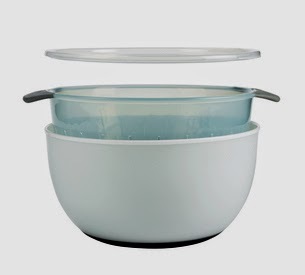 But the bowl on the large side and more suited for rinsing food or straining pasta or cooked vegetables over the sink and then popping into the bowl as you serve. Both items have a non-slip base making mixing a doddle as they grip to the worktop. The bowl and colander nest inside each other for easy storage and the clip on lid make the bowl into a nice and attractive looking serving bowl for a large salad at a BBQ's or party. Although not suitable for use in a microwave they are dishwasher safe and are BPA free. Many thanks to OXO Good Grips for sending me these products to review. Handy bits there Jan, I do enjoy using Oxo products, too. I'm always telling people my OXO peeler is now 17 years old. Built to last!! OXO Good Grips stuff are so excellent Jan. I have the batter jug and regularly use it for pancake batter as I can mix it and leave it in there and pour straight into the frying pan. I love the look of the bowl and strainer too. Nesting kitchen equipment FTW! Especially here in UK where we're stuffed for space and storage.